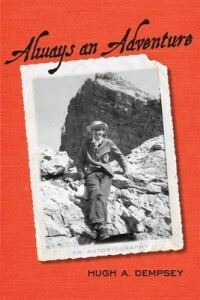 Always an Adventure is an upbeat and life-affirming story of one ordinary man who has made “a relatively successful career” (vii) and a happy, fulfilling existence for himself. (By ordinary, I imply no disrespect. I simply mean not a prime minister or a rock star, not the kind of household name that might promise sales.) Although his name is also familiar to historians for his several biographies of western Canadian leaders, especially his Big Bear: The End of Freedom, Dempsey as Chief Curator Emeritus of the Glenbow Museum in Calgary focuses more on his museum work, his role in the preservation of history, culture, and artifacts that contribute to our understanding of this land and the peoples who inhabit it. In 400 pages, including notes and index, Dempsey expands upon what he calls “the three passions in my life: Pauline, Native culture, and history” (73). Pauline, his wife of more than 57 years, is the daughter of James Gladstone, the first status Indian appointed to the Senate of Canada. Hugh Dempsey was born in 1929 in rural Alberta, the youngest of four sons of a World War I veteran and his war bride wife. He attended school in Edmonton. Working from the age of eight, he dropped out of high school to be an artist. He lost his first three jobs – to a buy-out of a sign painting company, to a birthday (the employer would have had to raise his pay to minimum wage as sales clerk in a stamp store), and to a newspaper shutting down. He describes his job searches and career shifts, acknowledging the importance of hard work, good luck, and “contacts” – what used to be known as “It’s not what you know, it’s who you know.” Networking, as it is called today. Dempsey weaves themes, motifs, and life lessons into his story, which are both interesting and inspiring. There are lessons about living through a Depression, a family being on relief, when “even the patches on my trousers had patches on them” (3). There are references to the destructive nature of competition between Calgary and Edmonton, government and private agencies, the Provincial Museum of Alberta and the Glenbow Museum. There are insights into office politics that are somehow reassuring, the knowledge that everyone meets “difficult people” in the workplace. There are comments about the mixture of philanthropy and ego involved in cultural institutions such as museums, which are begun as private enterprises but should be recognized as and funded as a public good. There are stories of “Indian politics” and political correctness, and what Dempsey sees as overreactions on the part of White gatekeepers to unsubstantiated criticism, overreactions stemming, he says, from a combination of “superiority and collective guilt complexes” (368). Reading Hugh Dempsey reveals a man of character with opinions based upon sound personal values learned from family and experience. Furthermore, it reveals a man who respects all people and cultures, who has a passion for history and a belief in the importance of preserving and transmitting it. By creating his own niche in history, he has ensured that the names and the role played by First Nations leaders in the history of the West are documented, exhibited, and published. He shares stories involving developing a protocol for acquiring, displaying, using, and sharing objects such as sacred medicine bundles and painted teepees. Family contacts enabled him to participate in filming the rituals surrounding the sacred dances. Dempsey defends the inclusion of religious artifacts or beliefs as integral parts of the cultures, using as his criterion for inclusion only that the object or the belief is of significance to the person or group that owns it, placing the focus on the source rather than on the potential audience. This autobiography contains few regrets or “druthers.” I suspect that if asked what could have been different, better, Dempsey would have spoken about an orientation toward the future, for some magic-wand solution to protect artifacts and concepts seminal to our history, our place on the planet, without their being subject to entrepreneurial whims and government parsimony. Because what the Glenbow has achieved, due in good part to Dempsey’s contribution, is remarkable, but is it safe? And what treasures remain forgotten elsewhere, in basements and abandoned warehouses, at risk of being destroyed before someone with Hugh Dempsey’s vision lucks upon an opportunity to rescue and preserve? We don’t even want to think about it. But, is there an archivist’s wish list? A preservationist’s charter? A checklist of what each individual, each family, each company, or club, or government department or agency, should preserve, and where and how to do that? Genealogists and historians, let’s not leave this to the archaeologists to have to piece together when it is already too late. Calgary: University of Calgary Press, 2011, ISBN 978-1-55238-522-7, 405 pp., $34.95 paper. Buy Always an Adventure at McNally Robinson Booksellers.